Dry to moist. Woods, disturbed areas. Light shade or partial sun. This is a 16″ to 40″ tall, erect, perennial forb that rises on one or more stems from a small caudex and rhizomes. It sometimes forms colonies. 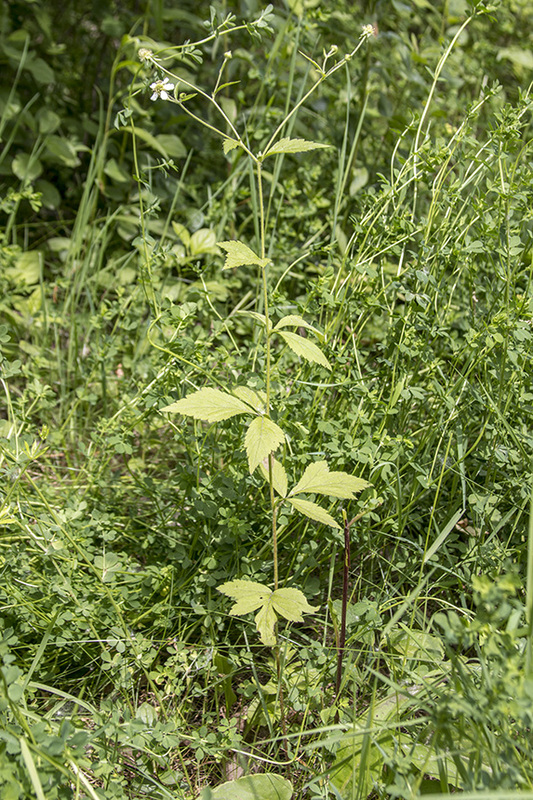 The stems are erect, slender, round, and green. They are hairless or sparsely hairy near the base, and densely covered with short, velvety hairs and scattered long hairs toward the top. 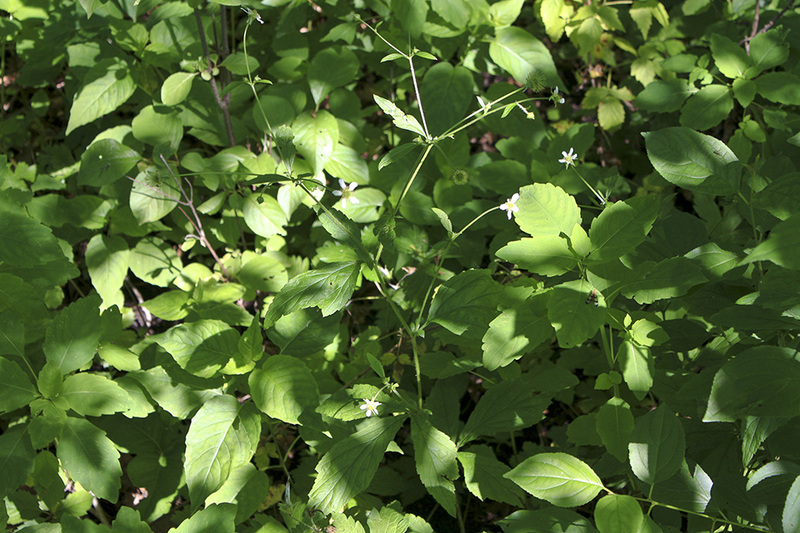 In the spring it appears as a rosette of basal leaves. The basal leaves are long-stalked and compound. They are usually palmately divided into 3 leaflets (ternate), sometimes pinnately divided into 5 leaflets. The terminal leaflet is broadly egg-shaped, up to 4″ long and 3″ wide, and may have one or two shallow lobes on each side. It is tapered at the base and tapers to a point at the tip. The upper surface is sparsely covered with appressed hairs. The lower surface is hairy. The margins are coarsely toothed with sharp, forward pointing teeth. The lateral leaflets are similar but narrower and slightly smaller. The stem leaves are alternate. Lower stem leaves are short-stalked, are divided into 3 leaflets, and are otherwise similar to basal leaves. The leaflets are lance-shaped or diamond-shaped (rhombic). 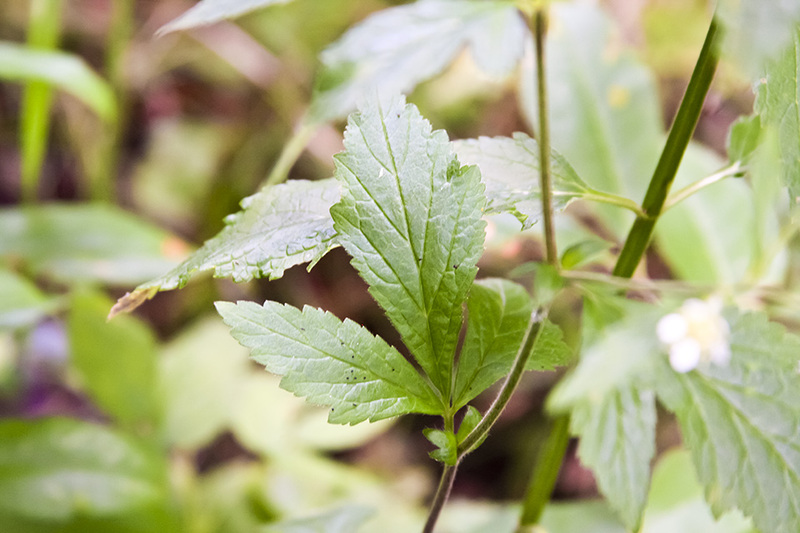 At base of the compound leaf there is a pair of leaf-like appendages (stipules). The stipules are egg-shaped, ⅜″ to ¾″ long, usually toothed, and sometimes shallowly lobed. Stem leaves become shorter stalked, smaller, and less divided as they ascend the stem. Upper stem leaves are undivided and almost stalkless. The inflorescence is a single flower or a loose cluster of a few flowers at the end of the stem and rising from upper leaf axils. It is on a stalk that is up to 2″ long; is densely covered with short, velvety hairs; and sometimes has a few long, silky hairs. 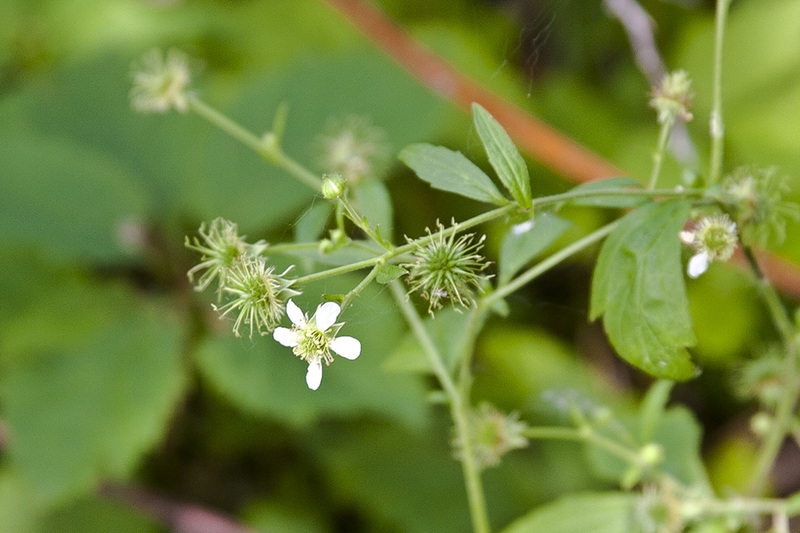 The flowers are about ½″ wide. 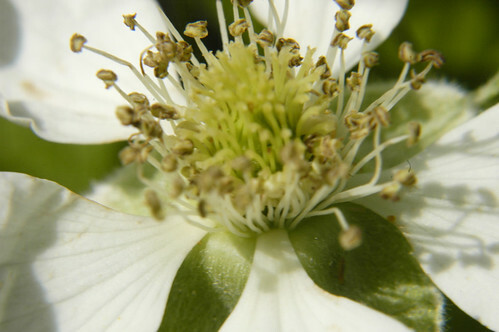 There are 5 sepals, 5 petals, numerous stamens, and 50 to 80 styles. 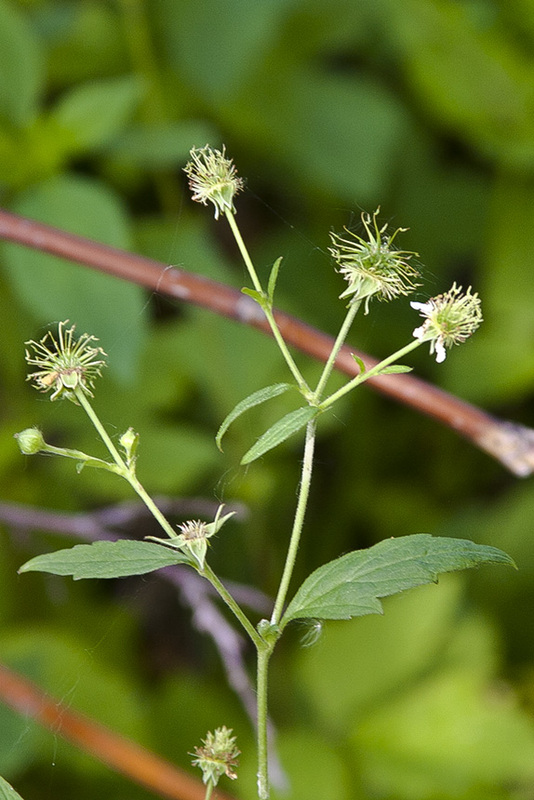 The sepals are green, lance-shaped, pointed, about 3 ⁄16″ long, and about 1⁄16″ wide at the base. They spread outwards or bend backwards. 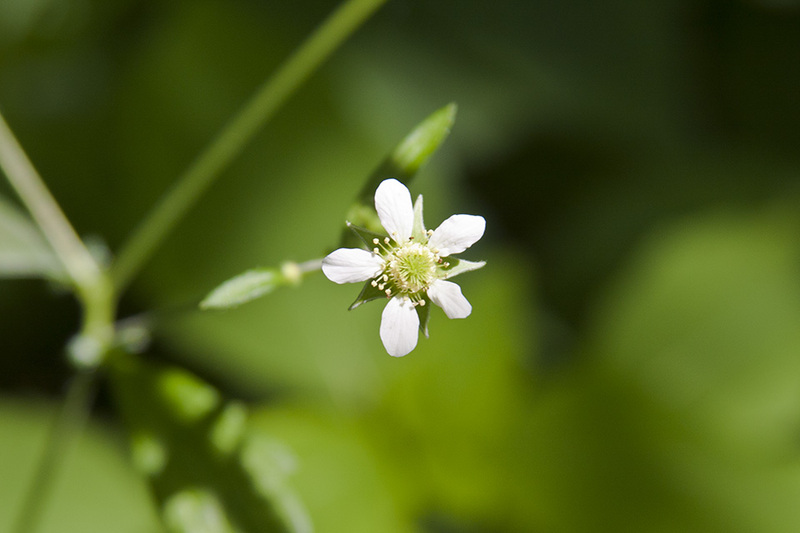 The petals are white, about ¼″ long, and about ⅛″ wide. They are distinctly narrowed at the base (clawed), well separated, and widely spreading or somewhat bent backward. They are as long or longer than the sepals. There is a raised structure (hypanthium) in the center of the flower. The stamens are arranged in a ring at the base of the hypanthium. They have white stalks (filaments) and white anthers that soon turn brown. The fruit is a bristly, spherical cluster of 30 to 60 seedcases (achenes). It is green at first, eventually turning brown, and is ½″ to ¾″ in diameter when measured to the tips of the bristles. 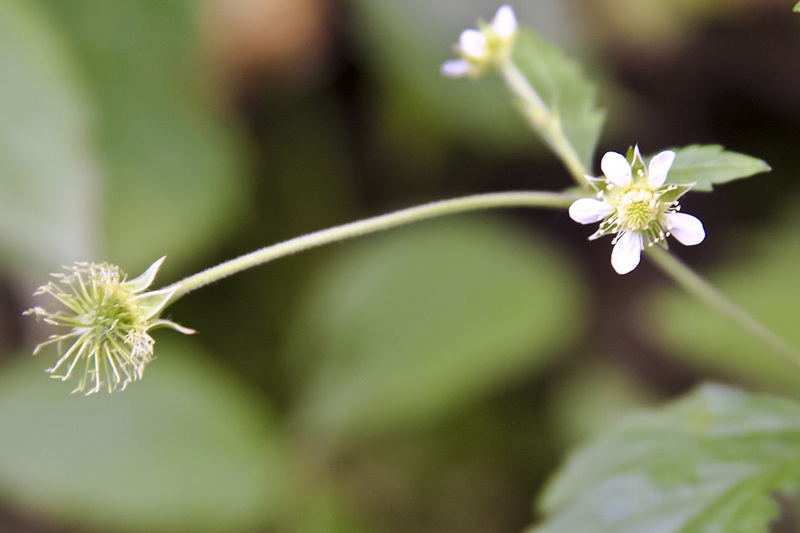 The sepals persist in fruit and are bent backwards. The bristles are the styles that have persisted in fruit, are about ¼″ long, and are hooked at the tip. The hooked tip is a 1⁄16″ long terminal segment that eventually falls off. The fruit disperses by clinging to fur of passing animals or legs of passing hikers. 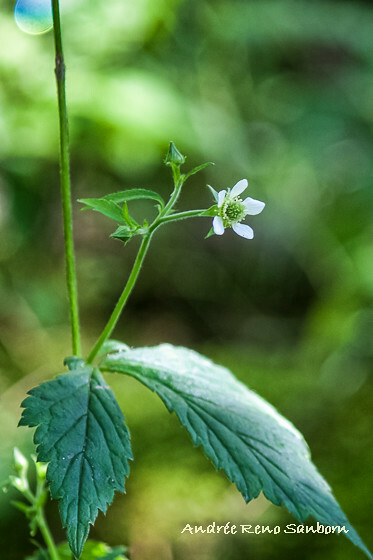 Large-leaved avens (Geum macrophyllum var. perincisum) lower stem is densely hairy. The terminal segment of basal leaves is round to kidney-shaped and larger, 2″ to 4¾″ wide. The lateral leaflets are much smaller. The petals are yellow. 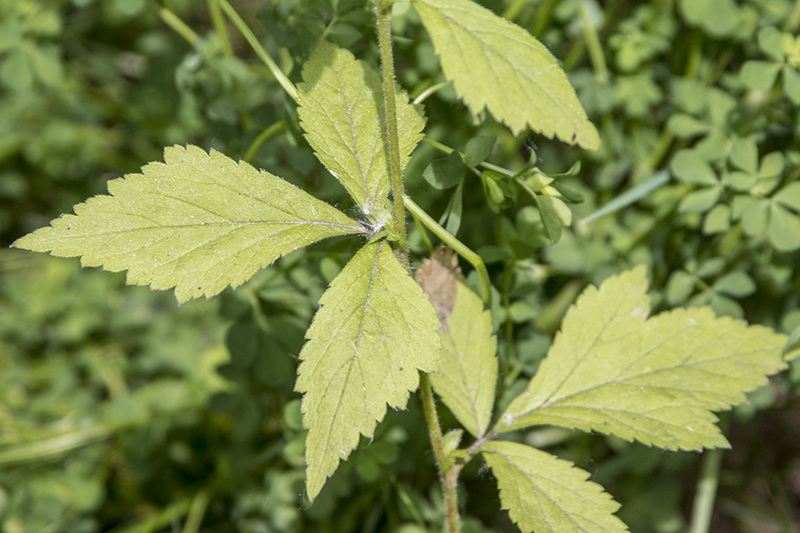 Yellow avens (Geum aleppicum) stems are stout. The lower stem is densely hairy. 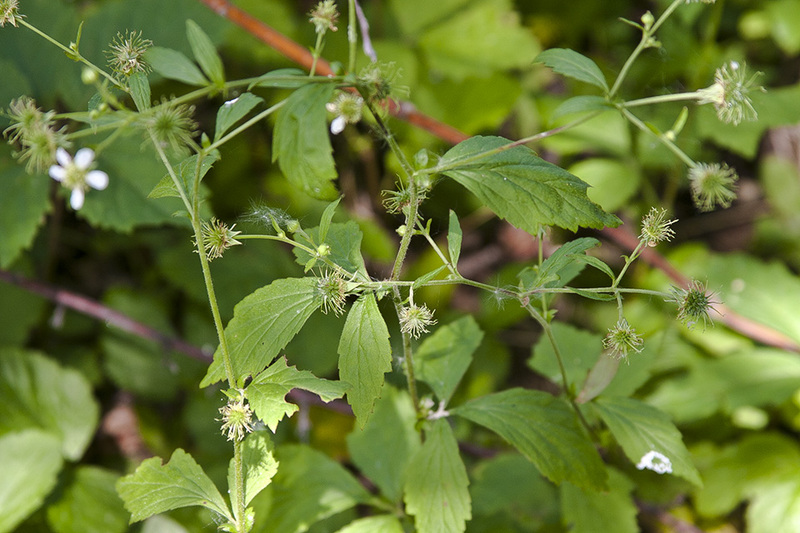 Lower stem leaves are pinnately divided into 5 or more leaflets. There are often minute, minor leaflets between the principal leaflets. The petals are yellow. It is found in wet areas. Sources: 2, 3, 4, 5, 7, 28. A cup-like tubular structure of a flower formed from the fused bases of sepals, petals, and stamens, that surrounds the pistil. Its presence is diagnostic of many families, including Rosaceae, Ribes, and Fabaceae.